Plot Summary: In 1972, the Apollo 17 mission discovered a hypergate to Mars on the surface of the moon. Soon a war breaks out between Earth and Mars, and Martian soldiers begin to descend from the sky, riding steel giants, intent on exterminating humanity. I think this was an original anime announced sometimes in February. Regardless, I think it has potential. The premise sounds intriguing and the staff looks nice especially the director, who worked on Fate/Zero. We also get soundtrack. composer Yuki Kajiura and Kalafia involved with the music as well. i never care about the director because many directors make bad shows when the source materials are bad. Fate Zero LN was a good source, that guy also directed Girls Bravo, bad manga source. It's all about the original writer or the original source. 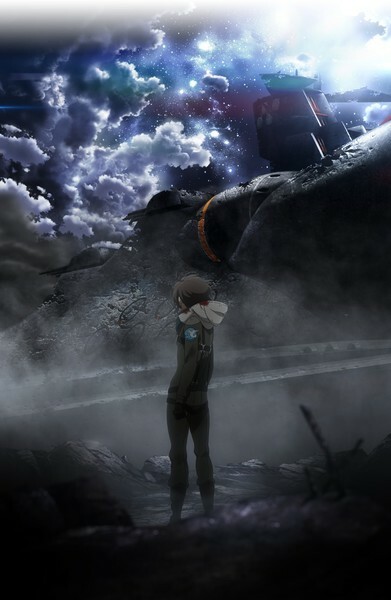 Ahhh another mech anime featuring high school student, because why would the army locked in an all out war use trained pilot rather than inexperience/whiny/naive teenager? I'm still gonna watch it cause I'm a sucker for mech (that one on the poster looks real good), but can I just have one mech anime without a teenager cast every decade? Decent start. The soundtrack was very noticeable along with the OP song played at the end. Nonetheless, it was somewhat cliche with the stuff going on and the characters. They explained the premise somewhat already but I hope there will be more based on the mechanics soon. I'm okay with the mecha designs right now although I don't think they are too special or anything. Seems like the MC is going play a big role in this later though. The wholespoiler[ Earth-Mars-Vers] thing has a lot of possibilities. Hope they will make the story deeper & wider. It could go in any direction. The real start of the story was awesome! I might give this one a few more episodes. Knowing that Urobuchi is the one behind it makes things pretty predictable. Expect max amounts of despair at every turn. Ehh, I hope there's some kind of twist coming otherwise that was some blatant death flag waving there. I mean I hope there is a twist cause the obvious I'm evil and have bad intentions guy was you know...obvious. Well, at least they didn't have characters walking around in a circle for half an hour info dumping, that's a plus. Anyways I'm willing to give the show a shot maybe it will surprise. I think they made up to the episode's predictability with storytelling, dialogue, and pacing, all of which I found great. Besides, this is Gen Urobuchi we're talking about here. There's got to be some kind of twist and/or new mystery coming up (if spoiler[supposedly killing the princess] wasn't enough), otherwise I'd be disappointed. I think this episode set itself out to establish characters and setting (especially setting), and that it did. Not to mention the amazing soundtrack. It was awesome. It gets a 4.5/5 from me. I'll freely admit that Urobuchi is a good author, it's just that the dude needs to cheer the f up. Speaking of soundtrack, when that song that played while the city was burning started, I couldn't help but go "Oh hey, Attack on Titan music." Yeah Kill la Kill and AoT came to mind during that scene. Well I guess if it ain't broke, don't fix it applies here. I often find mecha series to be boring, but I decided to try this one out after seeing some of the people behind it, and so far it actually looks pretty good. I like the character designs and the rest of the visuals, the music (especially the piece that played while the city burned at the end, and the theme song, since I love everything by Kalafina), and the characters seem pretty good from what's been shown so far, although I've never been too fond of the "I show no emotion and remain completely calm, no matter what's happening" type of character that Inaho seems to be. That's one of the best first episodes I've ever seen in anything! It's one of those times where the level of complexity is just a couple of orders of magnitude higher than anything else around. So far, it's excelling at operating on many different levels of scale: talk about political tensions of the entire world overlaps with the characters talking about the way they like their eggs. Everyone seems like a real individual with levels of nuance to them, for example, the teaching instructor isn't just an idiotic drunk, but also has a unique worldview that doesn't jibe with his society. The older sister character is cute-acting, but serious about her work. She chastises the lieutenant for drinking on the job, but also apparently sees some good in him too. I liked how the guy just was like, "Hey guys, there's a missile over there. We should probably get out of here." People might say that that's unrealistic or is an indication that that guy is weird in some way, but I think it was actually pretty realistic. In moments where something weird happens, things you say can come out pretty strangely. There was a lot of direct exposition, which a lot of people tend not to like. I mind it a lot less than most people do, so I was totally ok with it here, especially since what was being explained was pretty dense and complex (and interesting as a general statement). I would be a pretty sad if this were just a primer to explain the 'premise' and there's little to no idea-level stuff from here on, and that may happen since there are a good number of things like that. However I'd put my money on it not being that way in this case. I love how you can tell that they're on a spaceship/station in orbit around a planet before it's even explicitly shown in the first scene because of the diffuse light from below. One little thing I like is how the character designs have the characters sporting a bunch of little stray hairs. When I draw, especially drawing portraits, I tend to lose myself in those little skew hairs on people, and it's really cool that that's focused on here, too. It humanizes the characters a little, because it brings them closer to the realm of realism; their hair here is of biological origin, not artistically stylized. I also really liked that music that played when the explosion shockwave hit at the end. Really good aesthetic choice. Emotionally impactful. Middling first episode, okay but in no way great. Setup was a bit plain and the main character needs to find a personality fast. I can't help but think of similar-in-tone Code Geass: Lelouch of the Rebellion, whose stunning first episode blew me away. Aldnoah.Zero has a big fight on its hands to keep my attention, because right now it is kinda unimpressive.